This majestic fantasy-like tree with its wise old face, spiraling gold branches, and programmable lighting is the grand centerpiece in the imaginary fairytale-like setting of Inspiration Playground. Children can walk or wheel between two 10’ granite canyon walls with water cascading down from the Canyon Waterfall. A hand-sculpted 9’ slab of sandstone features curving stream paths and fantasy-like art embedded in a tabletop creek. 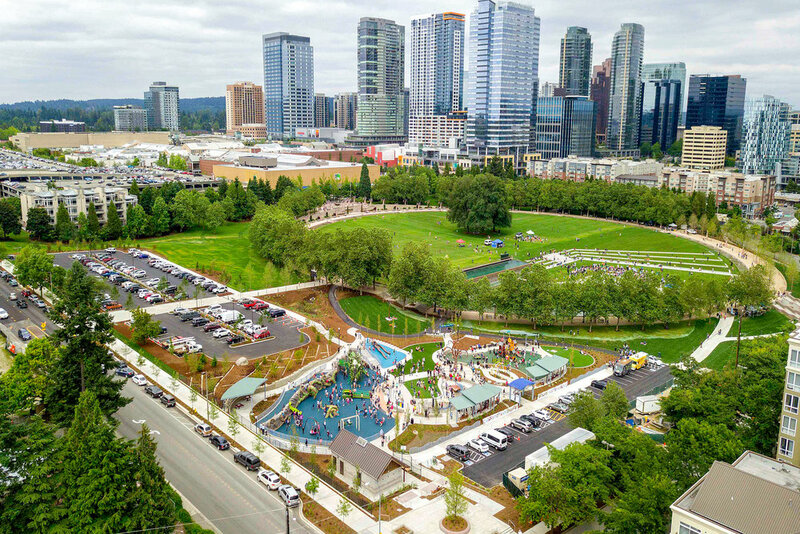 Inspiration Playground is an inclusive environment in the center of the new Bellevue Downtown Park in Bellevue, Washington. 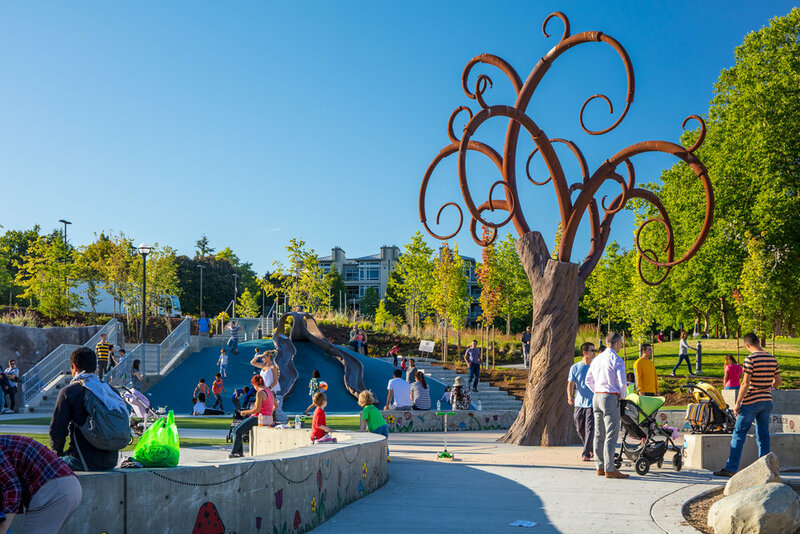 Made possible by the City of Bellevue and the Downtown Rotary Club of Bellevue, the playground was designed by Carol Henry, president of Design Concepts, Community and Landscape Architects, in Lafayette, Colorado. 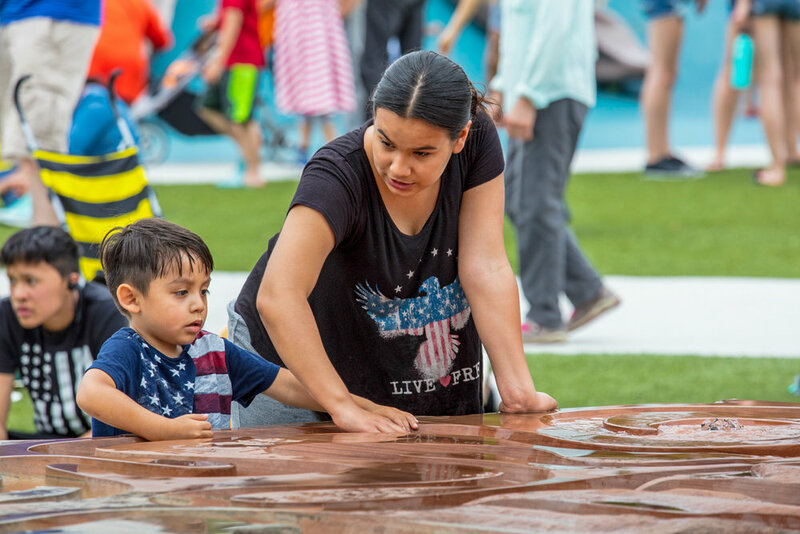 With multiple play areas and play opportunities for all abilities, the playground spaces will accommodate the needs of all children—kids developing typically, as well as kids with physical, cognitive, or sensory disabilities. It provides an open and secure environment with amenities for children, parents, and care-givers alike. 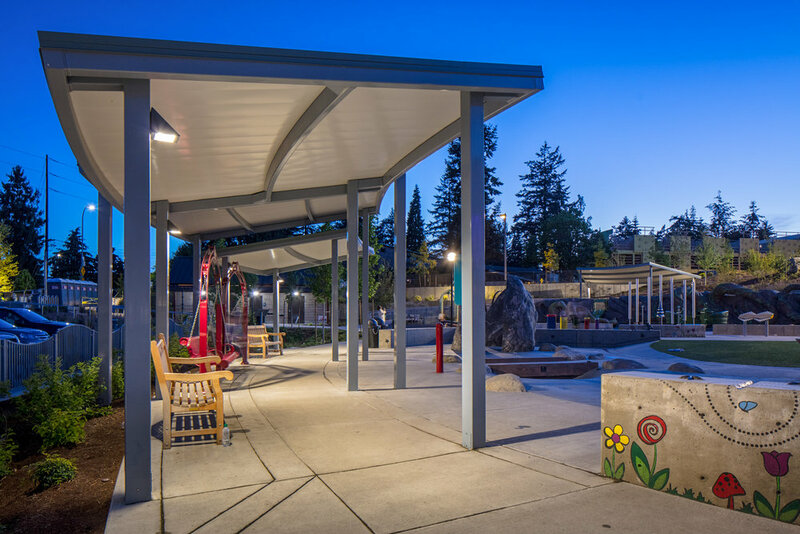 The universally accessible playground is compliant with the ADA Accessibility Guidelines (ADAAG), including Title II of the Americans with Disabilities Act (ADA). Inclusivity is only part of the genius of Inspiration Playground, though. The magic of Carol’s design is in its pure fun. The playground is artistic and whimsical, and near dusk when the Wisdom Tree begins to glow, the space is simply magical. 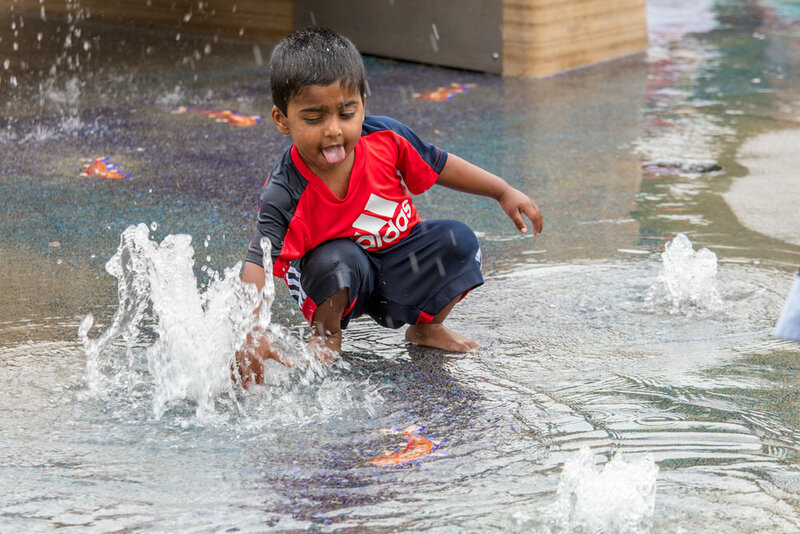 Climbing walls, looped walkways, gardens, sculptures, music, both younger and older childrens' play areas, and an interactive water play area all combine to create a wonderful mix of natural play and Dr. Seuss-like wonderland. 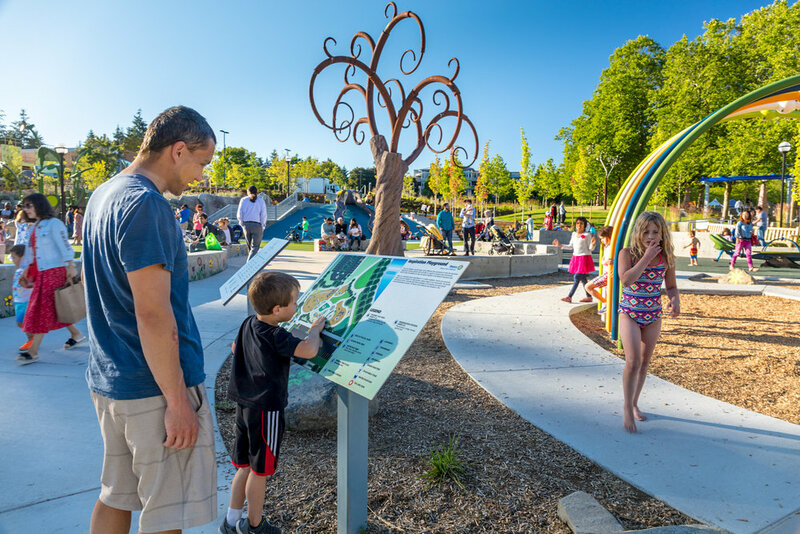 Inspiration Playground gives new meaning to “family fun” in Bellevue. Residents will be enjoying this playground for generations, and visitors will be putting it at the top of their must-visit destinations. People of all ages and abilities will be inspired and enlivened by this playground.